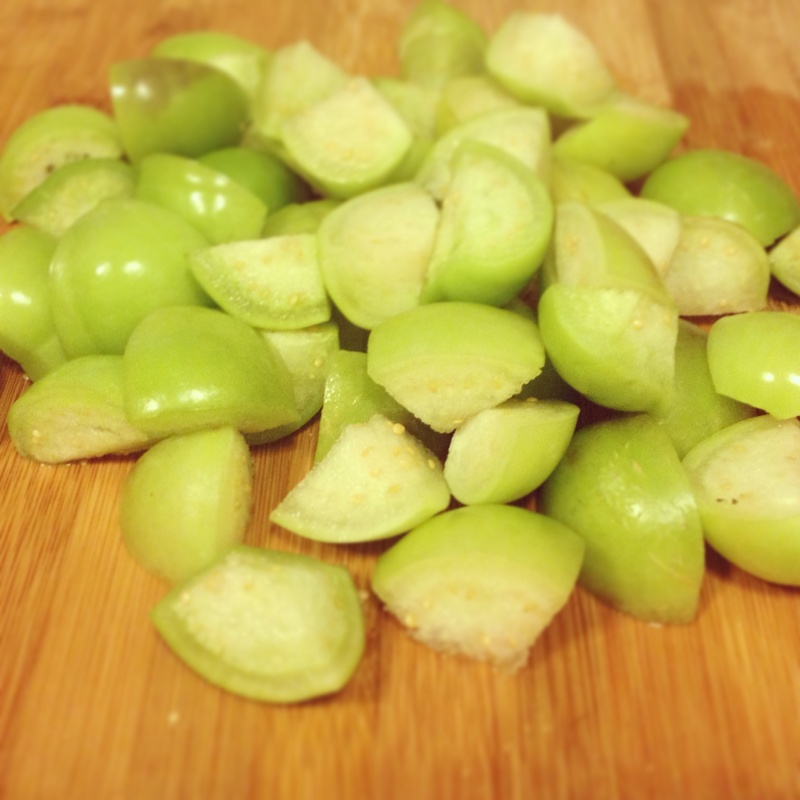 I bought a bag of tomatillos at the farmers market last week, with the goal of making tomatillo salsa. 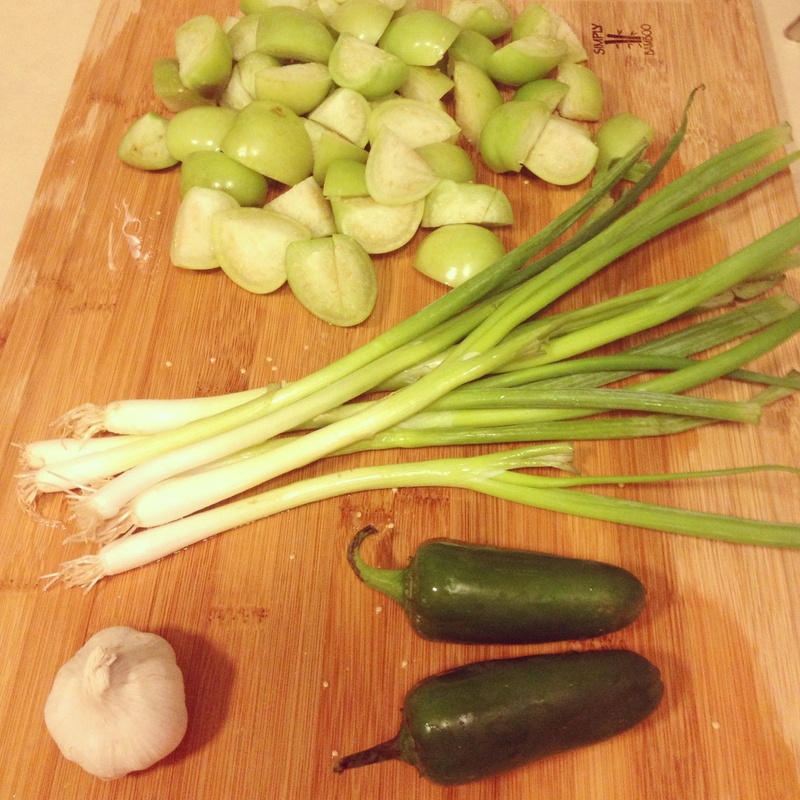 I had a vague recollection that I had seen a recipe on my favorite food blog, so I did a quick search, found the recipe and the three remaining ingredients I needed (scallions, jalapeños, garlic) and headed home – total farmers market cost for all four items was less than five dollars. I had enough cash leftover to get some berries, a gorgeous bouquet of dahlias, and a yummy bowl from my favorite food cart. I’m going to be so sad when market season comes to an end around here. 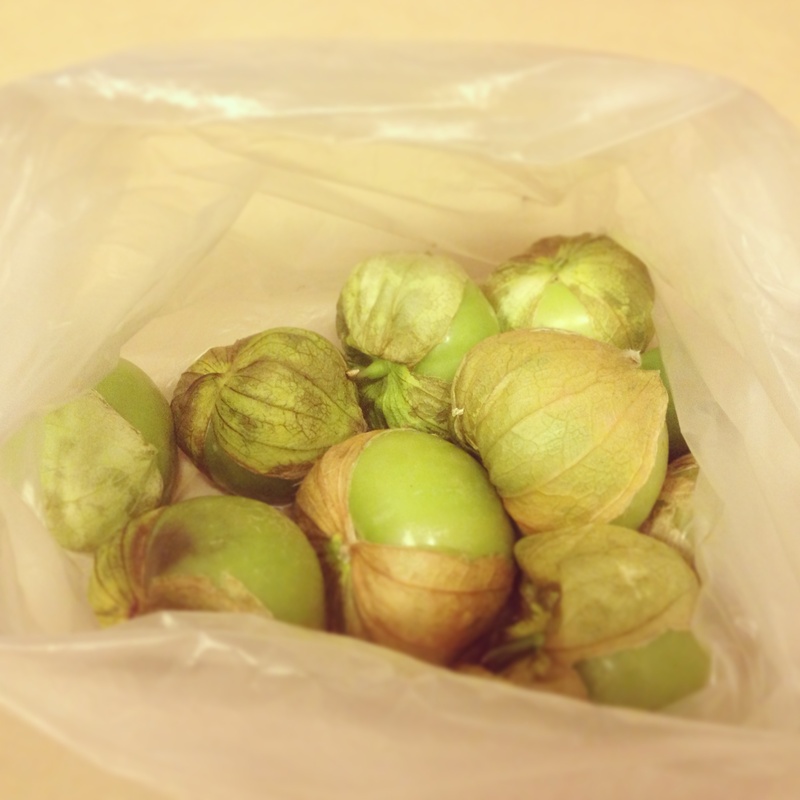 Tomatillo picking tip from the farmer (or at least, from the guy selling tomatillos at the farmer’s booth): you want to pick the ones whose husks have already split open at the bottom. Just as an FYI. 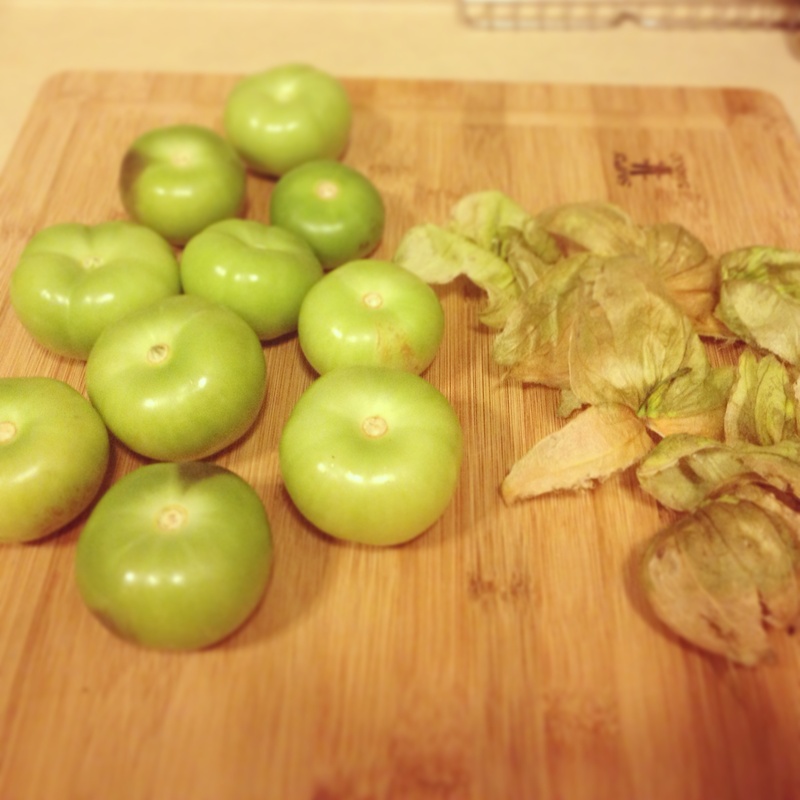 I’m a tomatillo novice, and always just assumed a tomatillo was a small green tomato in a husk. Turns out when you cut them open they have an almost eggplant-y texture, not like a tomato at all. 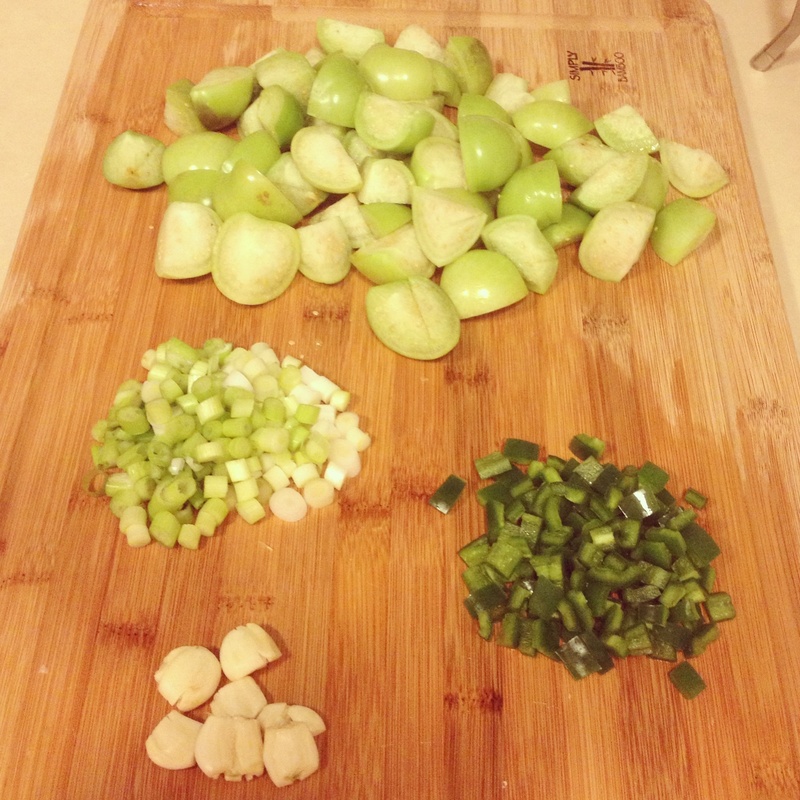 This is all going in the blender, so it barely needs to be chopped at all. I took all the seeds out of my jalapeños, but if you wanted more of a kick you could leave some in. 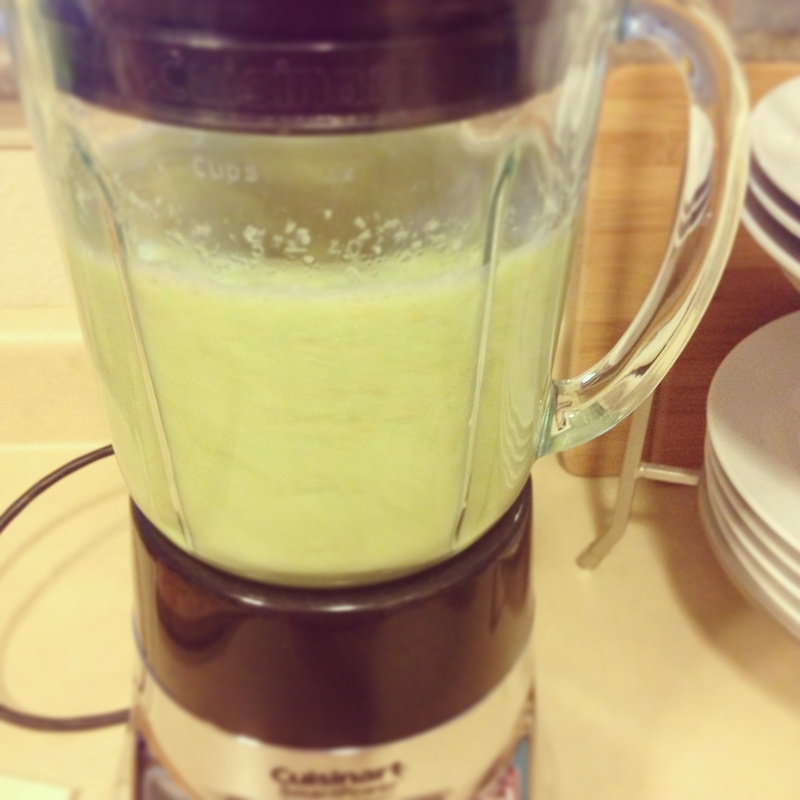 I didn’t have a lot of confidence that this would work in a blender, but there’s so much water in the tomatillos that it blended right up in seconds. This is clearly not technically “canned,” but so much cuter than storing in Tupperware. 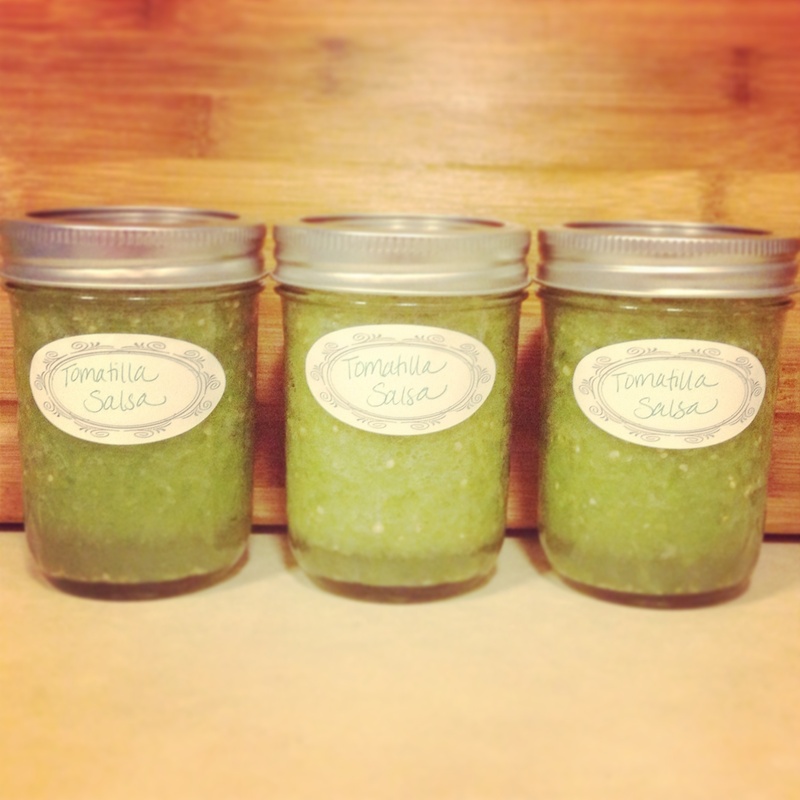 I spelled tomatillo wrong (tomatilla) on the labels because that’s what the recipe called it – oops!! Preheat oven to 400 degrees F. Heat a small amount of olive oil in an oven-safe skillet over medium-high heat. Season the top of the fish with salt and pepper, and then dip in a small amount of flour (this will help give it the pretty, seared look). 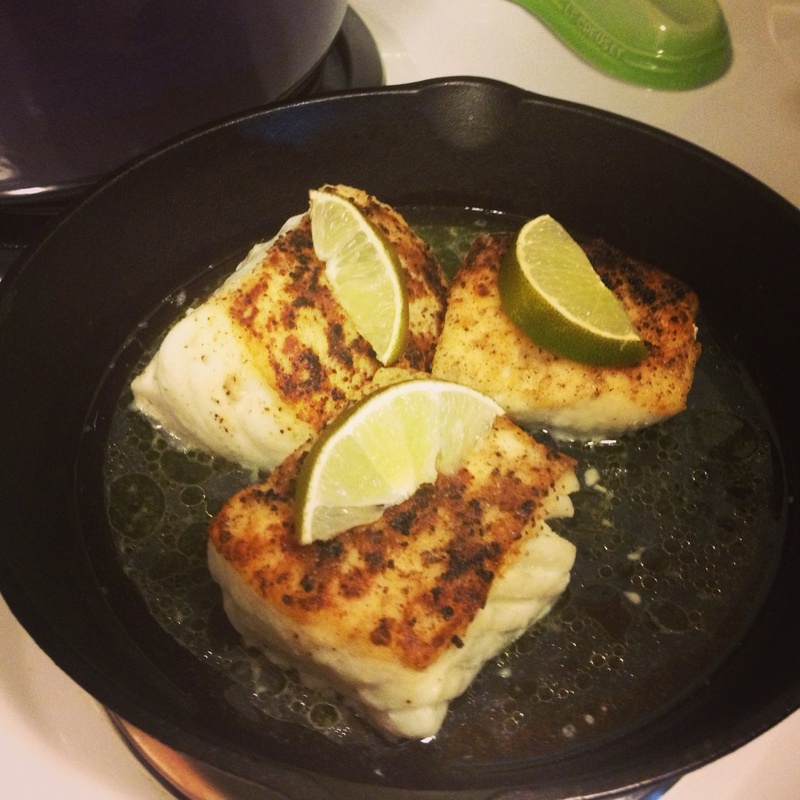 Place the fish, seasoned and floured side down (skin side up), and let cook for three minutes on the stovetop. After three minutes, flip each piece and move the pan to the oven (at this point I also added lime juice and lime slices to the pan). Cook for 4-7 minutes longer, depending upon the thickness of the fish (mine took about 10 minutes but it was very thick – check at about 5 minutes as you don’t want to overlook it. Fish should be opaque all the way through). 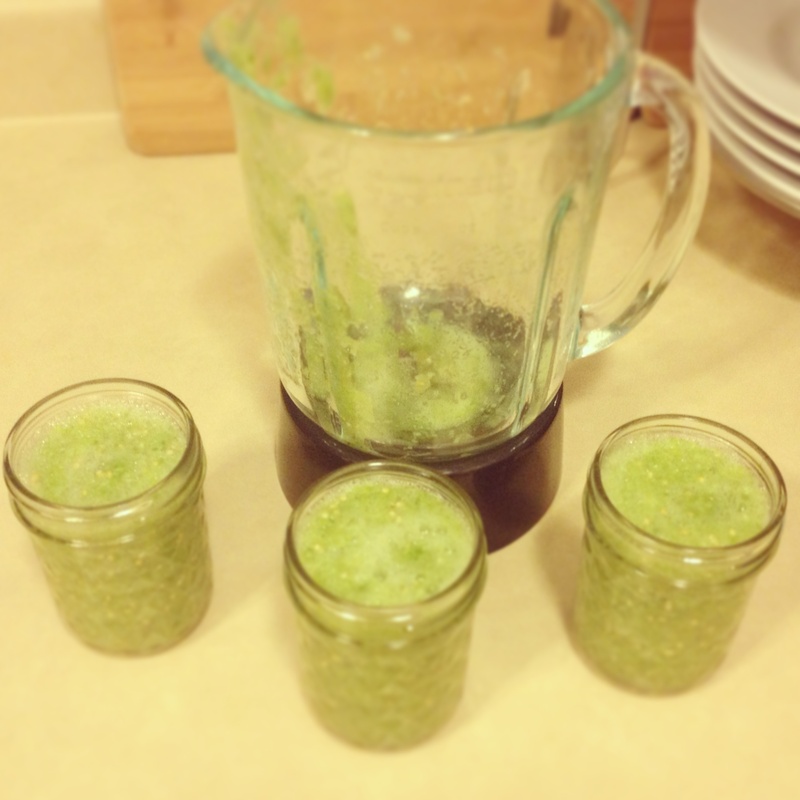 Top with tomatillo salsa, and you have yourself an entrée that would cost $30 at a restaurant. I served this with rice pilaf, grilled veggie skewers, and a green salad, and homemade peach cobbler for dessert. My friend Allison brought over an amazing bottle of Roussanne from her recent trip to Napa, and we had a lovely summer meal on the roof. These 80-degree days and 9 pm sunsets have really been spoiling us lately! 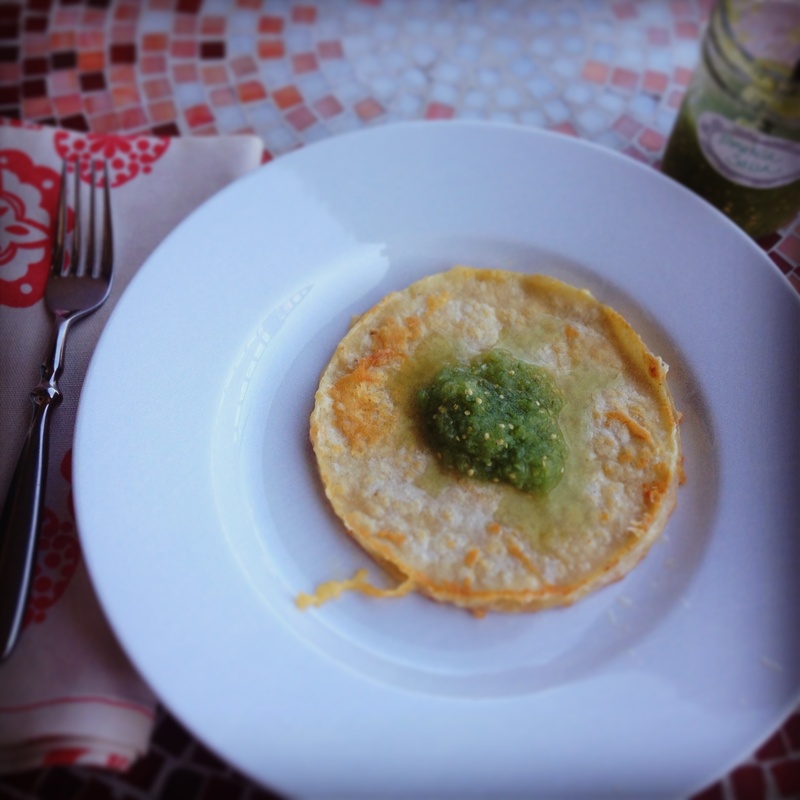 Note: leftover salsa goes great on a cheese quesadilla, too! 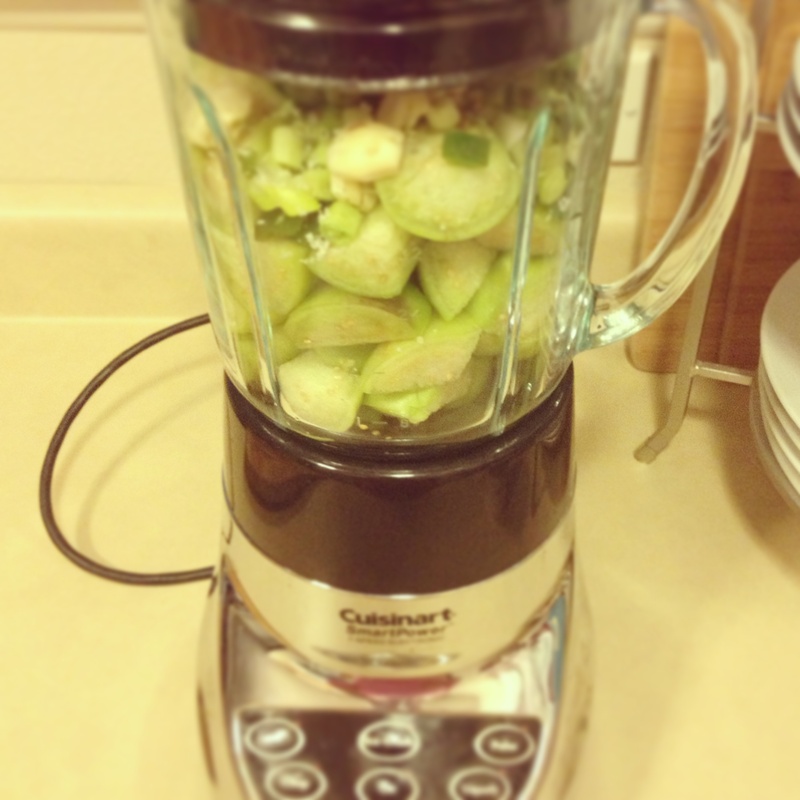 Purée all ingredients together until very smooth, either in a blender or food processor. Season with salt to taste. P.S. I made your pasta & Co. salad the other day, it was delicious!! Oh yay!! I love hearing that 😉 I think that salad and the zucchini galette were my most popular posts, at least in terms of people actually making them! 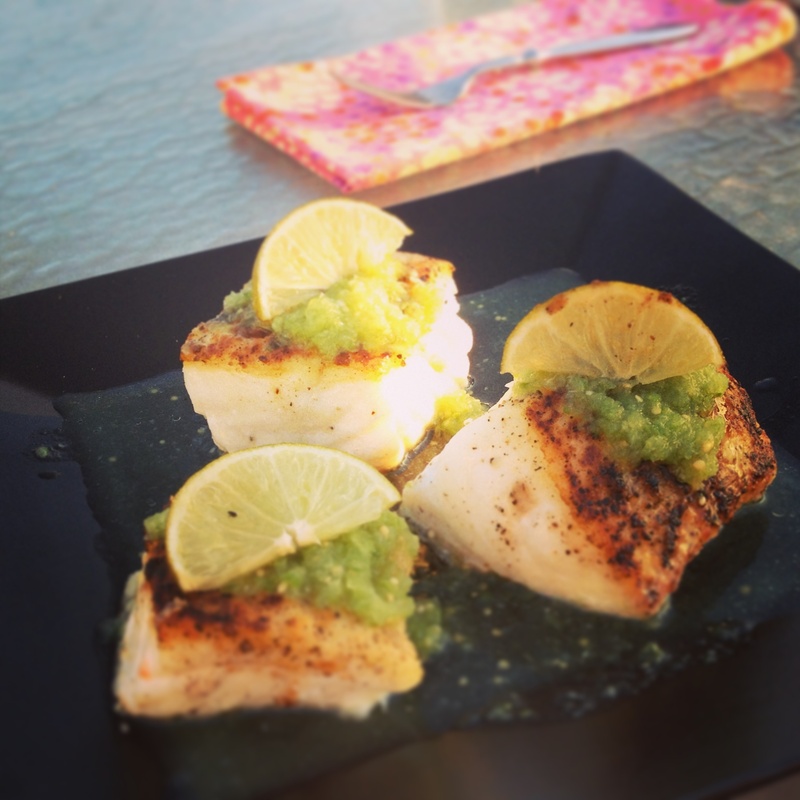 I’m attempting your halibut pan sear/bake combo for dinner tonight – wish me luck!